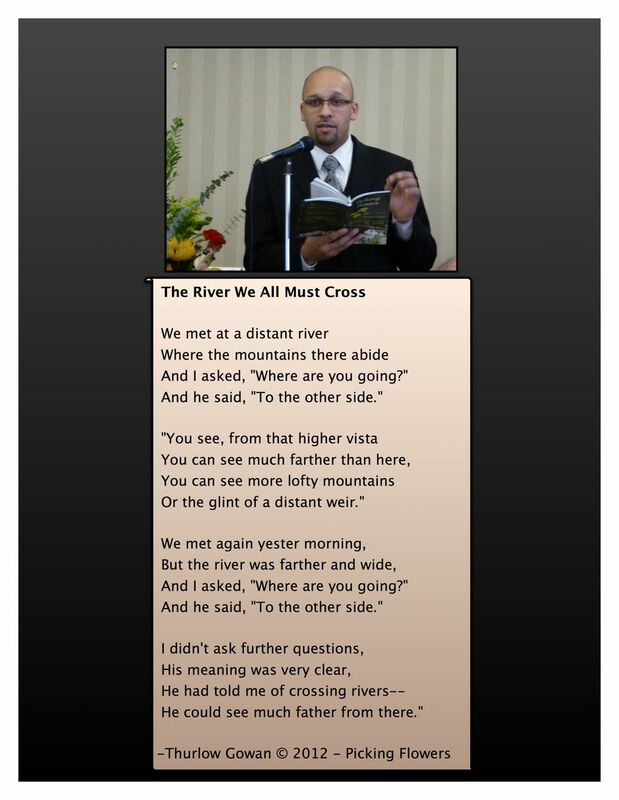 Congratulations to Robert Martens, local poet and friend of MSA PPS. His recently published chapbook Poltergeist has been shortlisted in the bpNichol Chapbook Award. The winner will be announced November 17th in Toronto. A week ago today we celebrated the life of Thurlow Gowan. The meeting area of Bevan Lodge was crowded with family and friends. 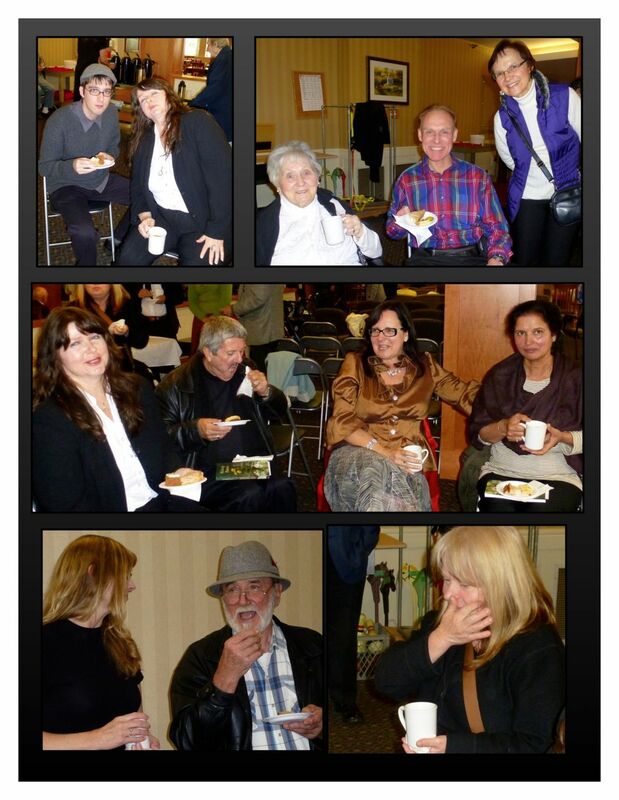 Guests shared memories, music and, of course, lots of poetry. 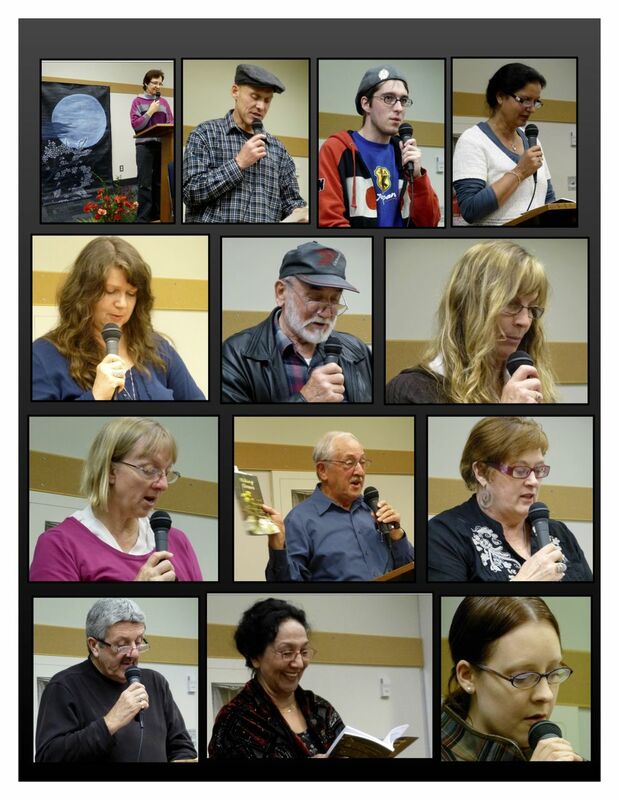 Family members and representatives from the Saskatchewan Superannuated Teachers Group, Abbotsford Square Dance Club and MSA Poets Potpourri Society all gave tributes. At the reception we continued to share memories and stories over coffee and goodies. 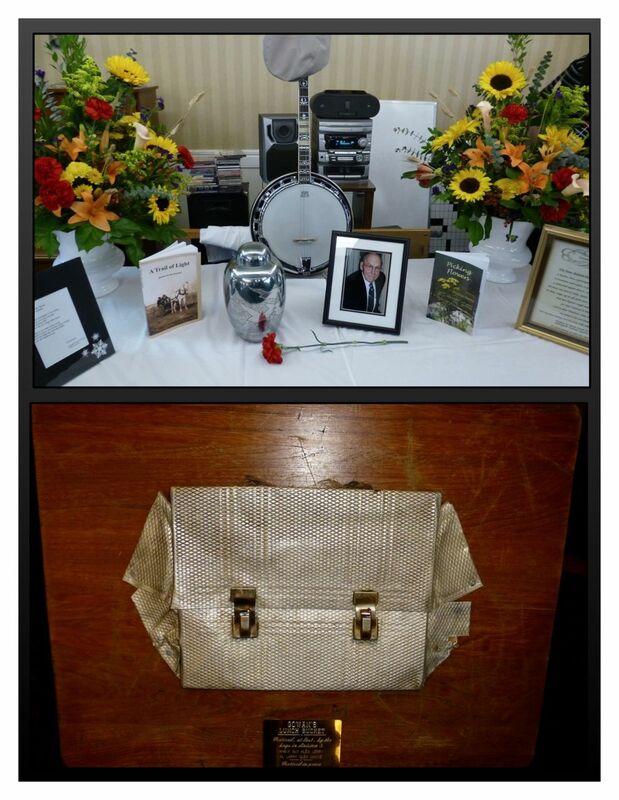 The memorabilia table included Thurlow’s banjo, cap, and two books with collections of his poems. Many attendees left with Picking Flowers, MSA PPS’s latest anthology that features his poems, in hand. On display was this keepsake from his teaching days. The story behind it is that at retirement his students absconded with his lunch bucket, flattened it, then mounted it on a desktop as a memento of his years as a teacher. 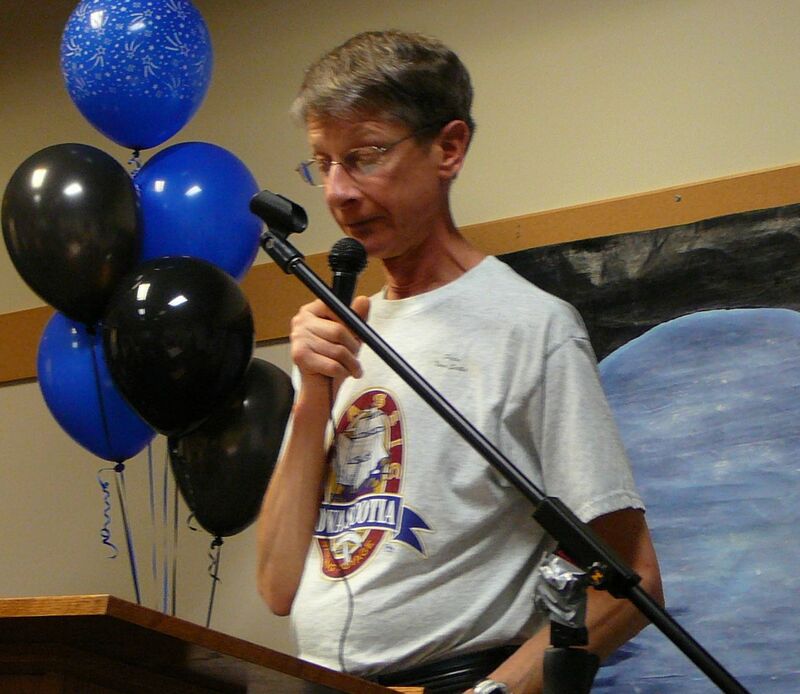 The Master of Ceremonies left us with these thoughtful words from Thurlow himself. 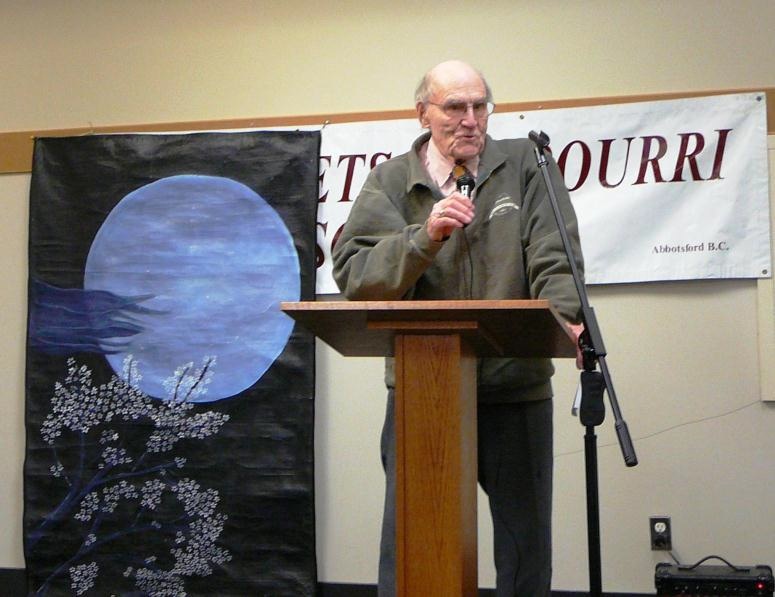 We received word that Thurlow Gowan, our Cascade Poet, passed away late Thursday afternoon, October 18th. 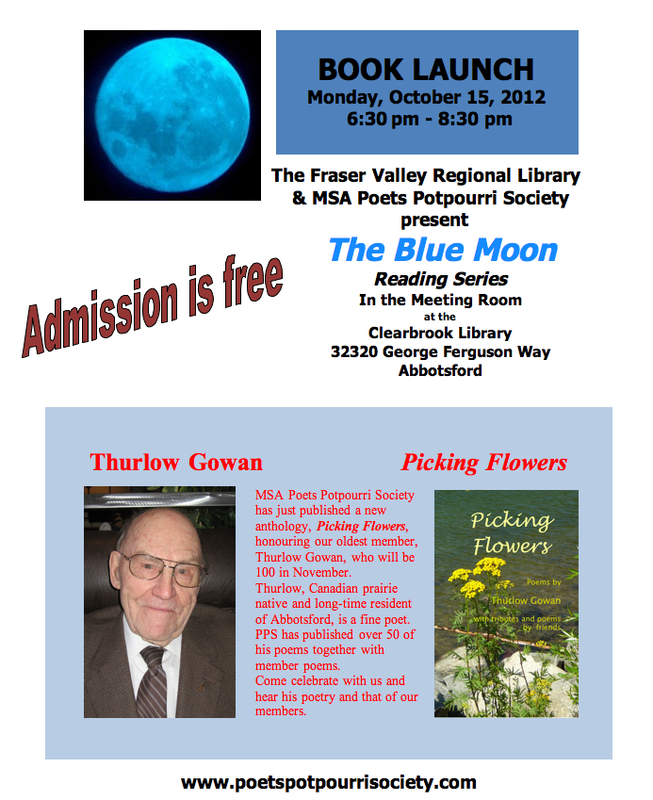 Thurlow Gowan at an MSA PPS Blue Moon reading night. Our sympathy goes out to Thurlow’s family. 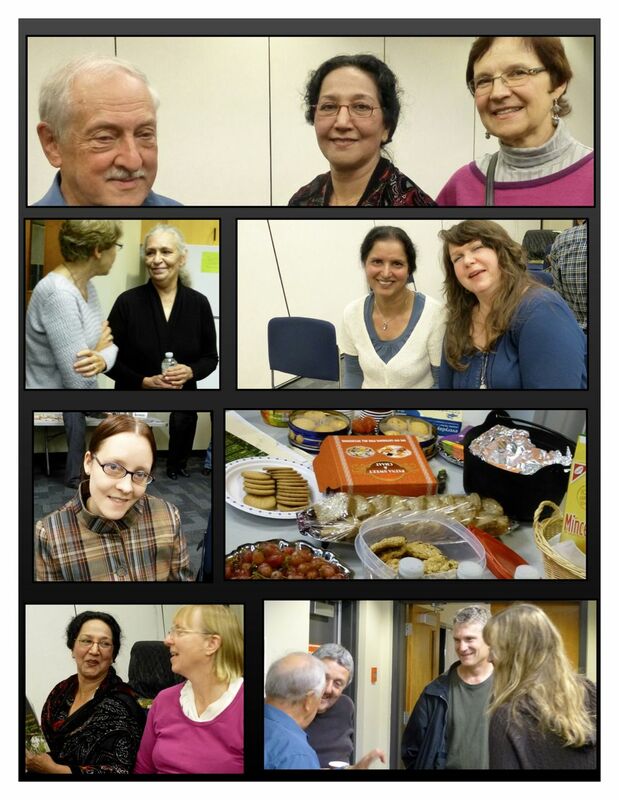 The MSA Poets Potpourri Society members ended the season’s series of public readings on a high note by launching their newest anthology. 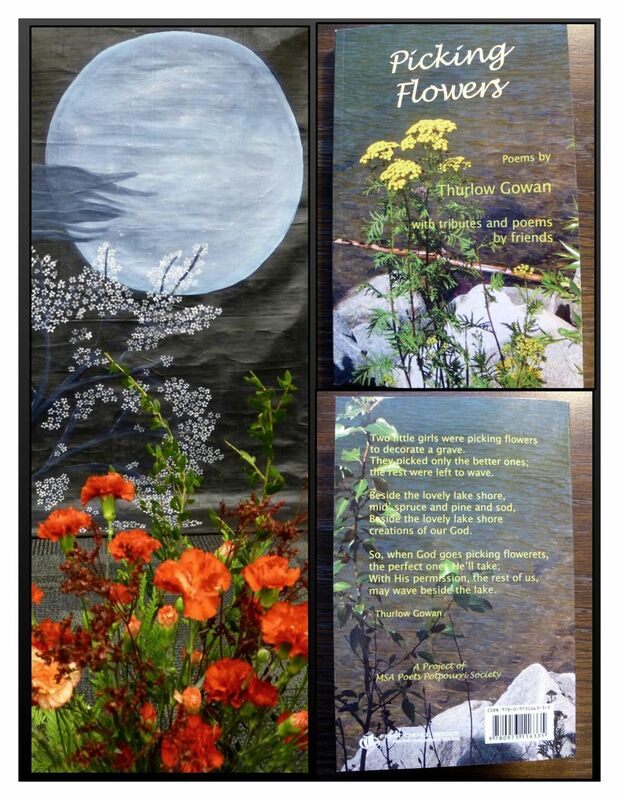 The 160-page volume Picking Flowers – Poems by Thurlow Gowan with Tributes and Poems by Friends was the product of months of work by editors Alvin Ens and Violet Nesdoly. It contains over 50 poems by Thurlow Gowan and comes out just in time for his 100th birthday (November 28th). 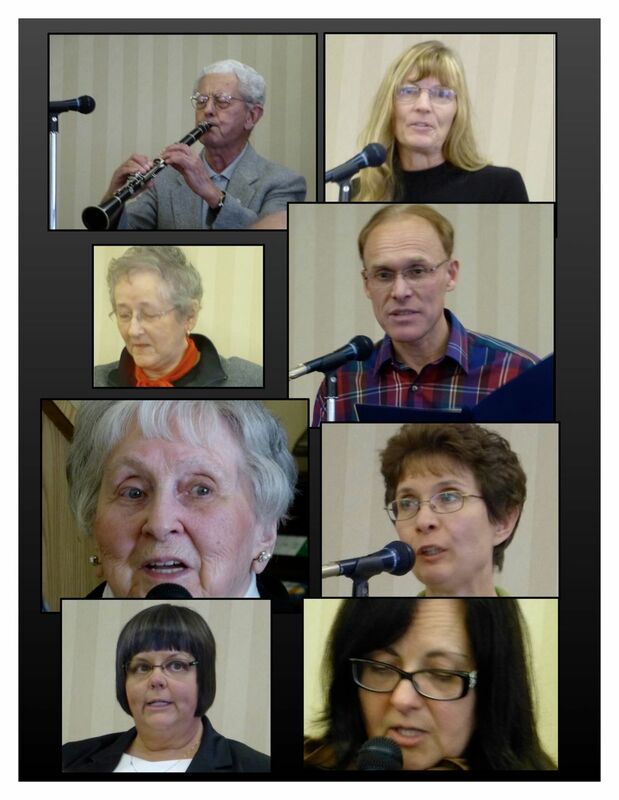 PPS members contributed to Tributes and Member Poems sections. The book is a treasury of poems rich in history and rife with homespun wisdom and the pioneer spirit of the Canadian west. (Thurlow grew up in Manitoba and, after stints of beekeeping and logging, taught in Saskatchewan, Manitoba, and British Columbia.) Black-and-white photos sprinkled throughout illustrate the changes one hundred years have brought to Thurlow and the world he and his wife Vivian inhabited. For the first half of the evening members took turns reading Thurlow’s poems. The fact that we all found something to read that was to our taste speaks of Thurlow’s range in both subject matter and style. After a refreshment break contributors read their selections from the Tributes and Member Poems. Unfortunately Thurlow was not well enough to attend the evening. His niece Beverly Urschel represented the family. 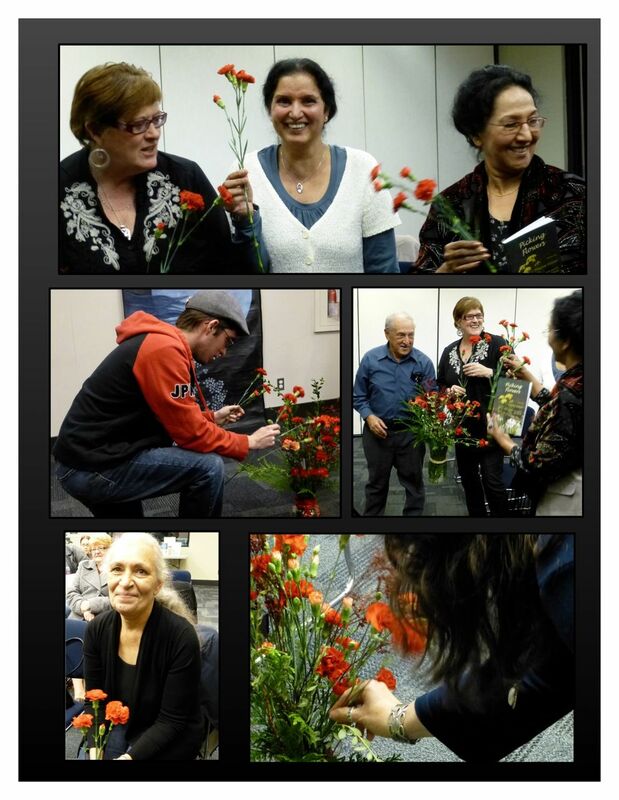 However, a group of MSA PPS members presented Picking Flowers to Thurlow a few days before the launch. 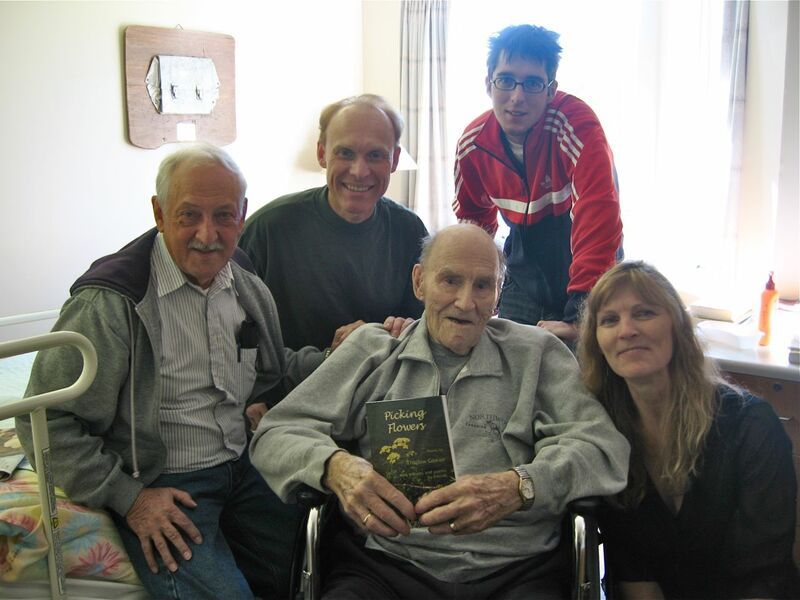 Alvin Ens, Brayden Sawatzky, Thurlow Gowan (holding his book), Nicholas Roberts & Shelley Haggard. Thanks to Shelley who brought bouquets of carnations. We ended the evening by picking flowers, and everyone took home a memento of the evening. Picking Flowers is available for purchase ($20). Check back for venue and time. New anthology launches October 15th! Note that there will be no open mic segment at this event.